He was a rov in Chicago. When the Satmar rov first came to the US, he fully intended to raise money and go back. While in Chicago, he ended up giving all the money to the Beserminer rov to build a mikva. R’ Yitzchok Eisik (like his brother R’ Tuvia Lieberman of Sao Paulo) was born in Kemecse. Then he lived in Hajduboszormeny, Hungary. 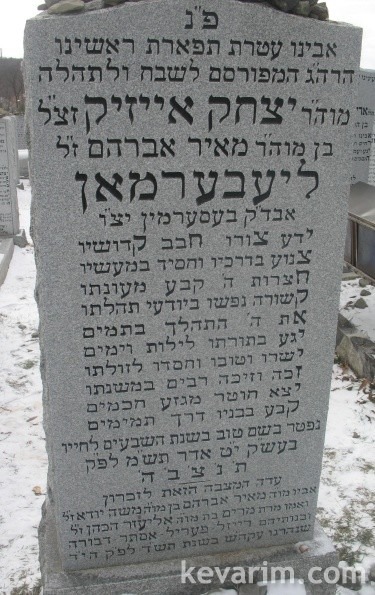 He was son-in-law of the Balmazujvaros Rav R’ Yechiel Mechel hakohen Fried. The Beserminer Ruv ztzl was an ish kodosh meod, a paradigm of yiraas shomayim. He gave a daily shiur in gemorah in Chicago until he moved to Brooklyn. I learned by the Beserminer Ruv after school from about 4 PM to 5:30 PM every day, together with about a dozen chasidishe boys of varying ages. Not one single boy who learned by him veered from his path after learning with him and it’s now about 50 years later. Every single talmid is chasidish with chasidishe families. Yehei zichro boruch. the story with satmer ruv is that the satmer ruv raised money in chicago for a mikva in new york a rabbisha ienikel came and asked for money cause he needed the money for a chasina of his child so the rabbi gave him the whole money that he made in chicago then the rabbi came to the besermina ruv and told him i cant go home without nothing so r’ yitchock issac ztz”l gave him al his money that he saved for marrying of his children and he never wanted to take it back he told the satmer ruv to pay him back on olem ho’emes. The Satmar Rebbe traveled to Chicago to raise money for the construction of a new Mikva in New York. A short while before the Satmar’s return someone requested that he help him in paying for a child’s wedding. The Satmar Rebbe gave this fellow all the money he had just collected on the trip. When the Besermina Rav heard what had happened he gave the Satmar Rebbe his own money to cover what he had lost. I’ve heard people say about certain rabbis that they were mekarev a lot of people, or that all of a certain rabbis talmidim became Talmidei Chochamim. This is certainly a new one. he served as Rov of the Chasidei Kobrin (and Karlin?) Shul in Chicago. Does anybody have any more information about this shul? Please contact me if you do.